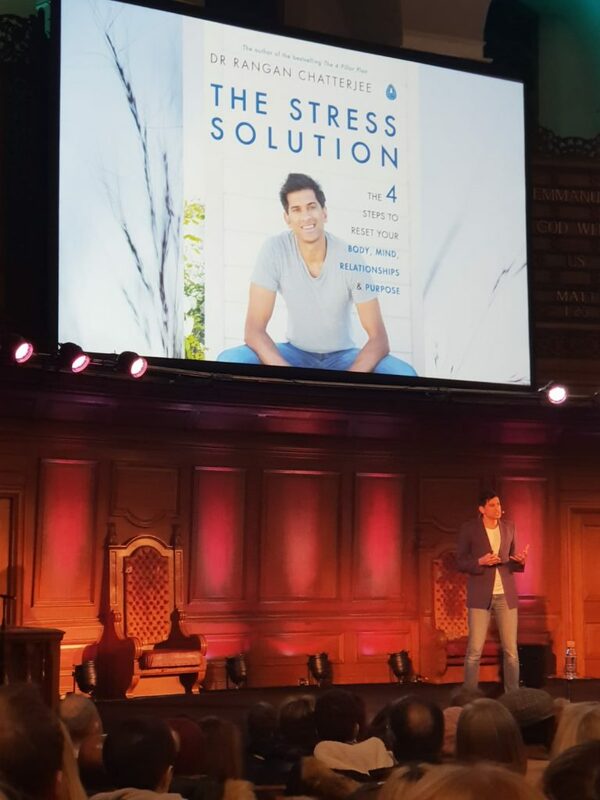 On January 9th 2019, Dr Rangan Chatterjee spoke for the How To Academy on “How to Combat Stress” promoting his new book “The Stress Solution: The 4 steps to reset your body, mind, relationships & purpose”. The World Health Organization (WHO) calls stress ‘the health epidemic of the twenty-first century’. According to Dr. Chatterjee, 80% of GP visits are stress related. Stress is not all bad, and short bursts of it can be healthy and necessary for us to survive and thrive, and our bodies are designed to handle short term stress. But when we experience stress for protracted periods of time, as is often the case with our modern lifestyle, it can have devastating long-term consequences for our health. Stress is also cumulative: the more stress we experience, the more sensitive to stressors we become. As a practising GP, Dr Rangan Chatterjee sees first-hand how stress affects our lives and has found simple but effective strategies to lower our stress levels. He identifies four pillars in our lives: Purpose, Relationships, Body and Mind. He suggests ways to combat stress from the perspective of these four pillars. Living a life that’s devoid of meaning and purpose is stressful, and research has shown that people with a strong sense of purpose enjoy better health compared to those who don’t, they sleep better and live longer. Here are some ways to increase your sense of purpose in life. Person – think of a person you feel grateful for, and focus on wishing them well. Pleasure – think of a pleasure you experienced – whether it’s a cup of tea or a new memory, and focus on it with gratitude. Promise – think about something that holds promise for the future – it can be something you hope will happen at work or setting a date to meet with friends, and think of it with gratitude. Scheduling can help us prioritise the most important things we need to do, improve our efficiency, and help us find time to do more of the things we love. Schedule your entire day to make sure your high value tasks get done. Include regular downtime in your schedule. When we ‘switch off’, a system in the brain called the default mode network (DMN) goes into overdrive, and this is usually when we come up with our best and most creative ideas. Love – do something you love. Intention – do something with intent. Vision – work towards a long-term vision. Engagement – engage with the world around you. These elements are all connected. Finding activities that cover one or more of these elements will help us find meaning and purpose, as well as be happier, calmer and more resilient to stress. Despite living in an ultra-connected world, we are more isolated than ever before, and relationships are the big stress superhighway of 21st century living, according to Dr. Chatterjee. Lack of connection is a major stressor (loneliness can be as harmful to your health as smoking 15 cigarettes a day) and nourishing relationships can help us relax and build stress resilience. Humans are not designed to be alone. Rejection and isolation have been shown to physically affect our genes, switching them into a more inflammatory state, and weaken our immune system. Human touch is as important for our minds as food is for our bodies. Professor Francis McGlone has shown that touch is not just a sentimental human indulgence, it’s a biological necessity. Human touch can lower our heart rate and blood pressure and reduce our cortisol levels. It raises the levels of Natural Killer cells, which protect us against infection. Touch also triggers the release of oxytocin and serotonin, commonly known as the ‘feel-good chemicals’. Below are some tips to help nourish your relationships and sense of community. Become a regular – join a club, a regular group activity. Make sure to schedule regular time to meet with friends. Plan intimate times with your partner without technology. Our body can also be a source of stress. Our brain constantly monitors our body and if the signals sent from the body are unpleasant or unhealthy, we become stressed. A few simple decisions about how we eat and move can help lower our stress levels. Whenever we eat, food, our gut bugs and our immune system communicate with each other. The information is then sent to our brain, telling it whether or not the body is under attack from bad food. The right food promotes a healthy microbiome, which in turn improves the immune system and reduces inflammation. Our gut is inhabited by many different bugs – known as our gut microbiome. An absence of gut bugs can increase our reactivity to stress. If we keep our gut bugs happy, our mood will tend to lift. We can keep our gut bugs happy by cutting out highly processed and refined foods (such as sugar and white flour) and replacing them with nourishing food such as plant-derived wholefoods rich in fibre (eg: vegetables, fruits, legumes and pulses). Eating a diverse diet rich in fibre is one of the best things we can do to live a more stress-free life. A diverse diet means a more diverse and resilient microbiome. Eating the alphabet over thirty days will encourage the growth of different types of healthy gut bugs. Use this chart as a guide and try to eat at least twenty-six different plant foods every month. In every 24 hour period, try to give your body 12 hours where it does not have to digest food. This can help your body detoxify, absorb nutrients and lose weight. The right amount of exercise can be incredibly beneficial for a variety of mental health issues and can help us destress. Go for a walk at lunchtime or jog for an hour – move your body each day but make sure you do not over-exercise. Getting a good night’s sleep (7 to 8 hours) is the most effective way to lower our stress levels. Nourishing our minds is as important as nourishing our bodies. Our minds need relaxation as much as our bodies need vitamins, fat and fibre. Being constantly connected is having an incredibly negative effects on us – it is important to build good boundaries and take back control. Fracturing our attention spans is very stressful to our physiology. Instant gratification is not good for us and can affect our brains negatively. Take a phone-free break, it can be even a weekend break or a half-day break. Get outside into the open air. Nature is expansive and forces us to look outwards, while technology encourages us to gaze inwards. If you can’t get outside, make sure that you have plants in your home and workplace, which has been shown to lower stress levels. Even a nature picture as a phone/computer screensaver has been shown to lower stress levels. One theory, by Professor Richard Taylor, as to why nature can be so healing involves patterns called fractals. Fractals naturally emerge in clouds, raindrops, lakes, trees etc. Studies have shown that our stress levels lower significantly after looking at images containing fractals. 3-4-5 breath. Breathe in for three seconds, hold for four seconds and breathe out for five seconds. Box breathing. Breathe in for four seconds, hold for four seconds, breathe out for four seconds. 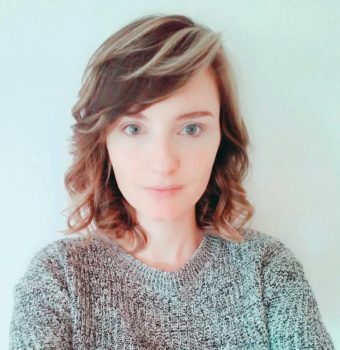 I have a MSc in Development Studies from SOAS University of London and a First Class BA in Linguistic and Cultural Mediation with a focus on Arabic language and the Middle East from the University of Naples, “L’Orientale”. I have worked on refugee response programmes in Jordan and volunteered for a refugee charity in London.